You are currently browsing the Speed Factor Racing blog archives for April, 2010. 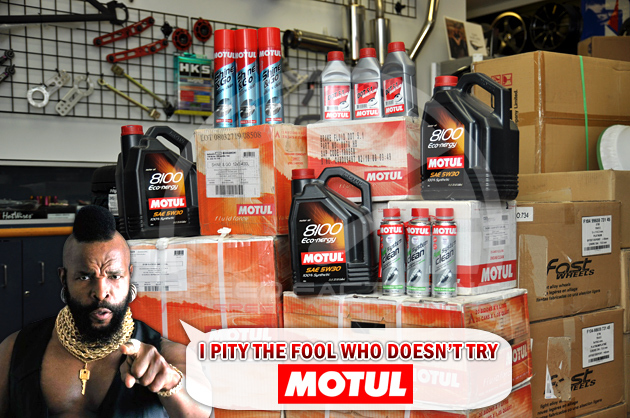 We Have MOTUL Products. Lots Of It. Our newest shipment of Motul products has arrived today, with more inventory expected to arrive. We’re carrying a HUGE selection with unbeatable pricing. Motul has been used with great success in motorsports by major manufacturers such as Mugen, Prodrive, Subaru, TRD, Nismo and Ford Racing. The technological benchmark in the field of lubricants for Motul’s driving force is its development of high quality lubricants. Striving for excellence in its products, Motul bases its creations on advanced technology. The reputation of Motul products is essentially based on the mastery of its technology in ester-based synthetic oils. Esters, as vegetable-based components, offer incomparable lubricating properties. As the pioneer of the introduction of these products into the automotive industry, then to Motorbikes and watercraft. Motul continues to upgrade its formulas to keep steps ahead of mechanical constraints on the modern engines. Not marketing hype, Motul’s exceptional standards and expertise have enabled Motul to develop technical partnerships with the most prestigious constructors in the world; (BMW, Porsche, Subaru, Yamaha, Suzuki). Our proving ground is the race track, our legendary 300V or Grand Prix 2T, have been part of over 150 championship wins. Every purchase of Motul Oil (min. 4L purchase) will receive a FREE gift until inventory runs out. Just a little something from us at Speed Factor to help kick-start your day! 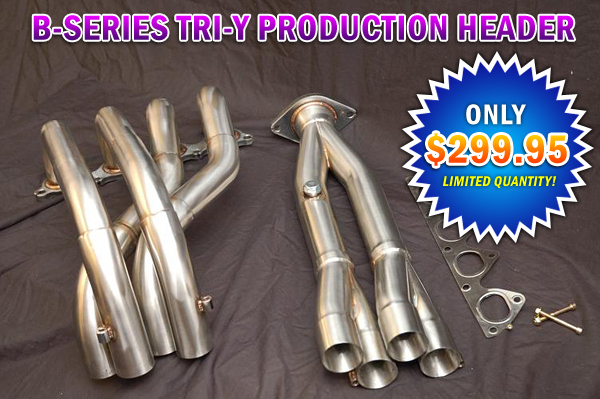 For the remainder of this month, we are offering some last minute deals on these amazing headers for B-Series motors. You will not find a better performing header for this kind of money. We are so confident in our low pricing, we’re advertising it! Best Production Header On The Market Today! This is THE MOST AFFORDABLE header on the market today that will outperform ANY header in the same price range. Fits ALL B-Series Engines Honda/Acura. All B18(A/B/C1/C5), B16, B20 Honda Engines. Clears Dual Core Radiators, Works with Power Steering & AC unlike other designs. 2) Does not fit with factory Type R transmission / motor brace, transmission brace can be swapped with GSR/LS/B20. 3) Does not fit with DA chassis. Will need possible modification to x-member and/or A/C bracket. Due to the long tube design for performance, this header will eliminate stock catalyst converter and is meant for racing only. It may require an extension pipe in order to bolt into your factory or aftermarket exhaust system. Head down to the shop and put your order in today! After a long 5 month wait from Japan, one of our customer’s aggressive fitment TE37 has arrived. 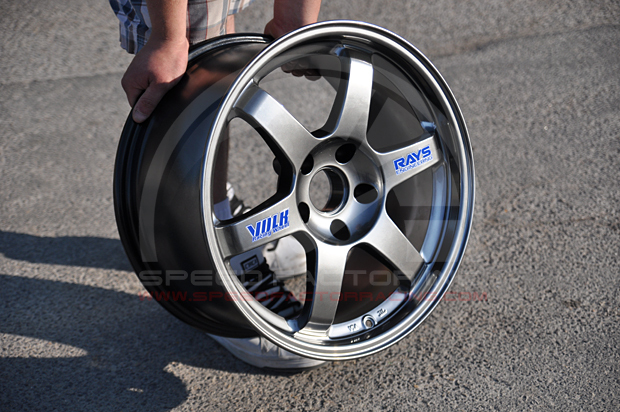 Specs: 17×9 +AGGRESSIVE Volk Racing TE37, Formula Silver – Very Unique Fitment! If you’re interested in any wheels from top manufacturers such as RAYS (Volk/Gramlights), SSR, Work, Weds Sport, Advan, Enkei, etc. give us a call or e-mail and we’ll be able to find the perfect look/fit for your car. 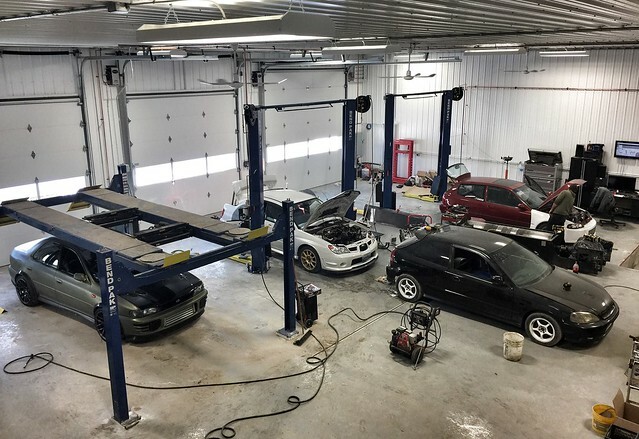 With the weather being so nice and with many of our customers bringing their cars out of winter storage, we want to help get your cars ready for a new season of motoring. 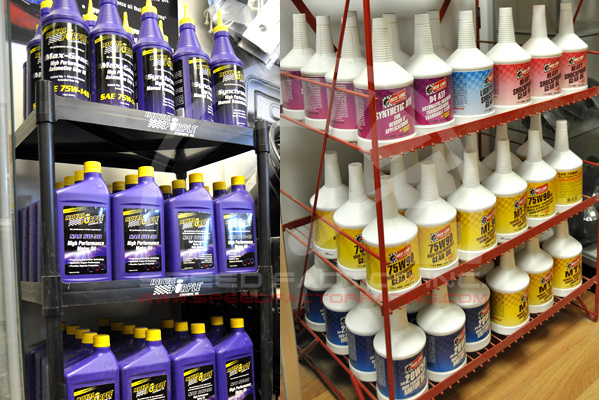 We are now fully stocked with Redline and Royal Purple products. Whether you need to change out your oil, transmission or differential(s), we have you covered at the best prices! Eneos and Motul oil shipments are coming soon! Luminous Yellow Gramlights 57D – Exclusive! We finally have one of our new Gramlights 57D in stock at the shop! They offer a sick concave face and come in 3 attention grabbing, limited edition colours. Gram Lights 57D Drift Wheels. These wheels are a limited edition and are only available for a limited time in these extremely limited sizes colours. They are currently used in D1 by the R-Magic, RYO and other teams sponsored by RAYS. 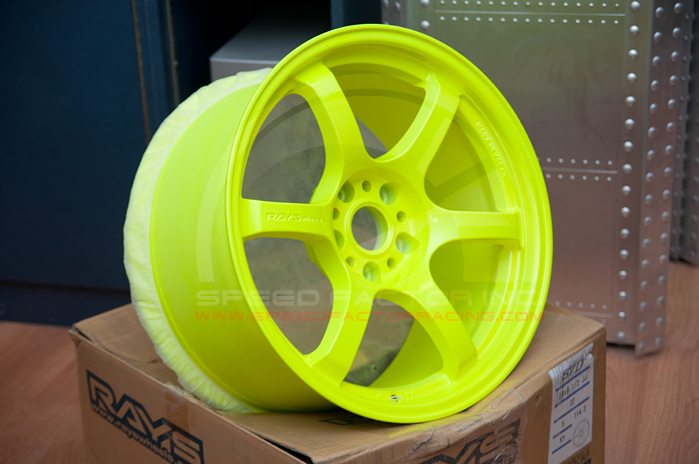 These wheels are cheaper than the Volk Racing range, hence making them a very popular wheel to use for drifting or transfer the look to the street. Either way your car will look great! These wheels are available in 5 stud fitments in limited widths, offsets and diameters to suit a limited range of larger Japanese cars. The wheels only are available in a three limited colours only. Ceramic White is the standard colour with Luminous Yellow and Luminous Orange available at extra cost. We have a set of Luminous Orange and Luminous Pink on our way to us. Contact us for pricing! They’re more affordable than you’d think for a quality limited edition wheel. GP Racing Bling, Now In Stock! We have received some SWEET new wheels from GP Racing. We have two sets of the all new GP Racing GR-8 in an exciting Black Chrome finish with blue accent (18″ and 17″). We also have a set of 15″ Gloss Black GP Racing GR-3. 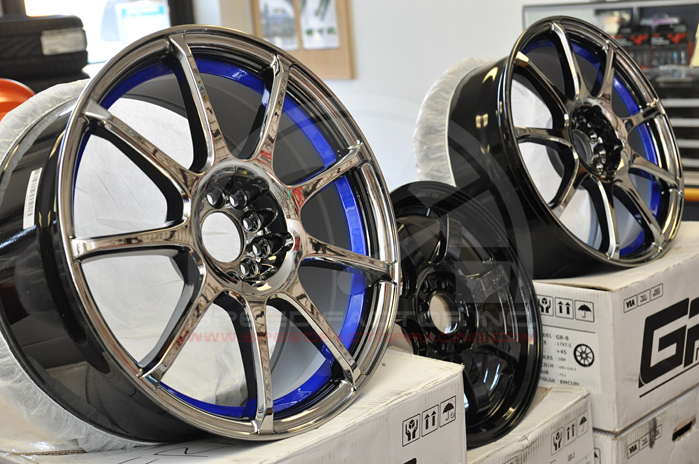 We’re offering an unbeatable low pricing on these amazing wheels we have in stock! Call us, e-mail us or stop by the shop for more information.